Apple launched the version of OS X 10.10 Yosemite at Apple’s Worldwide Developers Conference 2014 with a list of brand new features as compared to earlier version release OS X Mavericks. The new features include translucent backgrounds for app windows, better typography, new design elements for close, minimize and maximize. 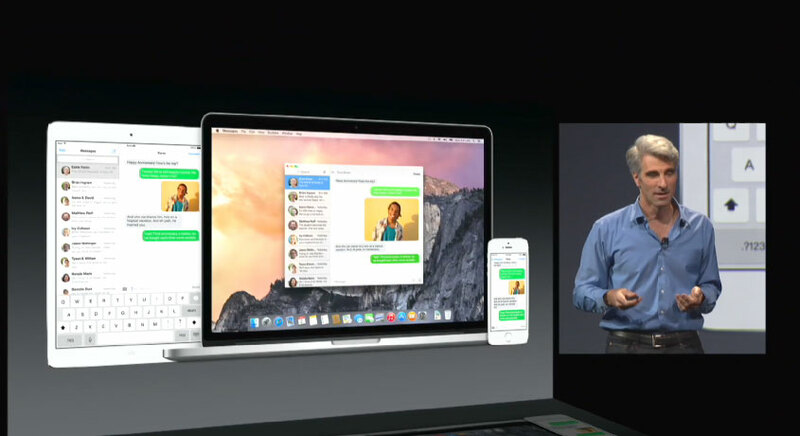 Also new look for iCalendar, iMessage, iPhoto Library, Safari browser and host of other apps. App icons have a clean, consistent design and an updated system font improves readability. Have a look at the comparison of how the user interface looks like in OS X Mavericks and the new OS X Yosemite. You will notice significant changes to how apps are display and also check the new design of Trash can, its translucent too and you can see the files dumped inside as well. OS X Yosemite brings new updates to Safari Browser with Spotlight integrated and host of other features where you can view all tabs at once. You can also move through tab windows but moving your mouse left to right on tabs. Safari groups similar tabs and displays them in a grid format, stay tuned for more information on Safari browser. OS X Yosemite brings new cloud storage app by Apple called iCloud Drive that stores all kind of files quite to Google Drive. You can organize files by type, size and date and it can accessed across devices like iPhone, iPad, Mac and even a Windows PC. iCloud Drive brings tags and Spotlight to drive for easy search. OS X Yosemite brings new Today view in Notification center where you can view widgets for Calendar, Weather, Stocks, Reminders, World Clock and social networks. You can download additional apps from Mac App store and add to notifications center. The new Spotlight feature in OS X Yosemite brings search to desktop with categories of results, you can view rich suggestions from Wikipedia, Maps, Bing, App Store, iTunes Store®, iBooks Store™, top websites, news and movie showtimes. OS X Yosemite brings changes in design to iCalendar, Map and iMessage with translucent backgrounds, cleaner user interface and better features. OS X Yosemite brings features of Calls and SMS to Mac where you can view messages via iOS and Mac and even reply to messages from Mac and make or receive iPhone calls using your Mac as a speakerphone. Feedly, the RSS app picked up more than 500,000 new users in the two days after Web Giant Google retired its RSS app – Google Reader. Feedly is a new way to browse the content of your favorite sites, RSS feeds, Tumblr blogs and YouTube channels. Feedly is an RSS news reader re-imagined for android phones and tablets. It makes browsing faster: the content of your rss feeds are transformed into pocket-sized cards which load very fast and are easy to browse. Feedly also offers two way sync with Google Reader: articles your read in Feedly are automatically marked as read in Google Reader. Feedly makes sharing content on Twitter, Facebook and Google+ very simple. Download the app and write down your comments! !